Roughly every two or three weeks, the market throws me a curve ball. Tuesday was one of those days. Monday, I opined that it was likely that the market was very close to a short-term top. I suppose "close" is a relative term, and in that sense, it was and still is "close" to a top. However, Tuesday's sideways action forced me to re-examine my charts, and reconsider whether a top was forming... and, if not, what might the new price action mean for both the immediate future and the big picture? After examining the NDX, SPX, FTSE, Hang Seng, Shanghai Composite, et al, I have come to the conclusion that yesterday I committed the exact short-term error I referenced a few articles ago. This error is one of the most common pitfalls for Elliott Wave analysts; specifically, my error was that I had advanced the degrees of trend a bit too quickly. I am going to focus on the NDX charts for the purposes of this article, but the SPX and Dow Jones should follow a similar track. The first chart I'm going to share is the chart I posted pre-market on Friday. This chart will highlight the error and provide a comparison for my revised count. You can see that the market has actually tracked the chart extremely closely, because the error was not one of actual trend, but one of degree (or position) of trend. Since Elliott Wave is fractal in nature, and I had the larger trend correct, the predicted fractals were still correct, and thus my projections were still correct. Below is the revised chart. I have highlighted the error I believe I made with a red circle (I considered drawing in a frowny face, too). You can see that this chart doesn't change the trend at all, it only shifts our position within that trend -- in other words, the blue 3, 4, and 5 have simply shifted over as a result of my revision to the count (from "3" to "iii" and so on; same waveform and fractal, but different degree of trend). I have also posted my target price range for the top of wave 5: 2337-2380. So, all that said, it is still technically possible that today marked the top as I predicted yesterday (as I type this article, the futures are down). But I now view that as unlikely, and I think the odds are very good that we see higher prices over the next couple sessions. I think it's important to stay light on your feet in this market, and to be able to admit potential mistakes quickly if the market action dictates, so as not to compound the mistakes. So, now that we've revised the short-term count, the question becomes: what are the larger implications for this change? 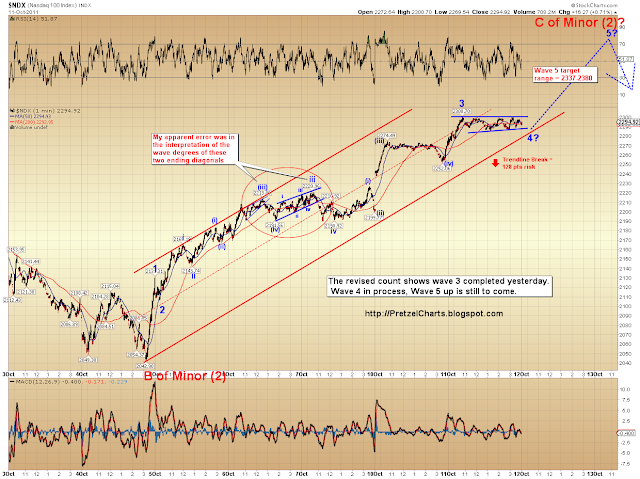 This small shift in count potentially has a big impact on the structure of the NDX. 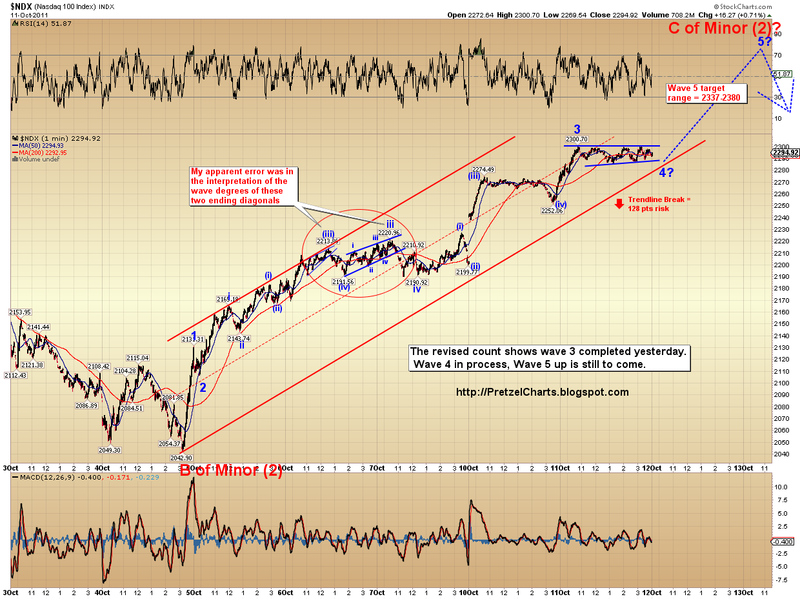 Most recently, we discussed the intermediate position of the NDX in this article. In that article, I suggested we needed to watch the rally closely to see if it became a 3-wave rally (indicating it was a (y) wave) or a 5-wave rally (indicating it was a C-wave). The shift in count impacts the bigger NDX count because it is now apparent that we are, in fact, in the throes of a C-wave up. 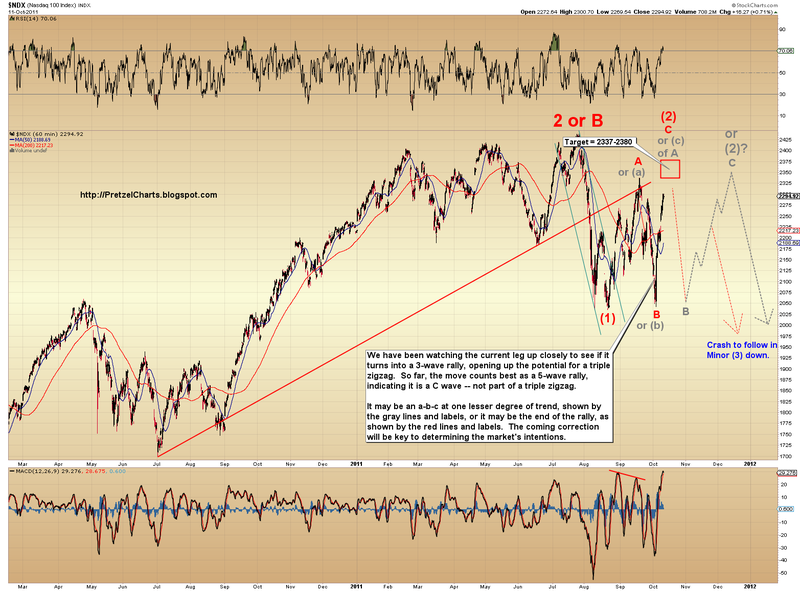 This potentially has immediate bearish implications for the market, as outlined below. 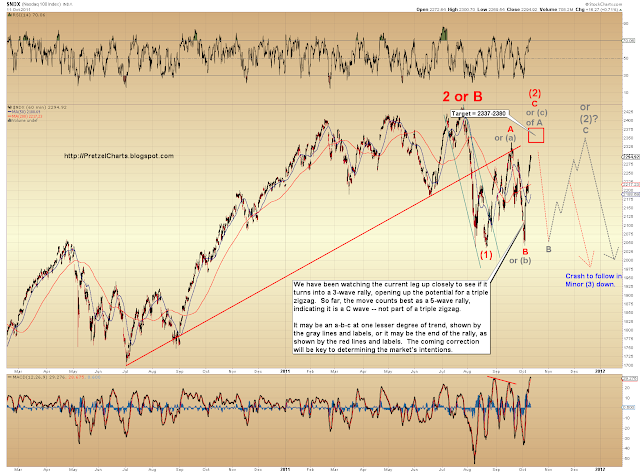 Below is the updated long-term chart of the NDX. I have annotated two possible counts, to indicate my view of the most likely possibilities. Note that the target of 2337-2380 remains the same under either count. Also note that the projected path for both counts is similar until about mid-way up the gray line, at which point the more bearish count diverges and heads down to substantial new lows. The first count (in red) shows the current rally as the C wave of an A-B-C rally to complete Minor (2). If that is the case, the coming high will be a significant top. The second count (in gray) shows the current rally as the (c) wave of an (a) (b) (c) rally. That would then complete wave A of a larger A-B-C. This count expects the market to make one more cycle from the top of the range, to the bottom, and back. This speculative labeling would constitute a shift in the degree of trend, as we discussed earlier in this article. Further, if the S&P 500 (SPX) is in wave A of Minor (2), as discussed yesterday, this labeling shows the most likely route for the NDX to take. So I am expecting a top soon. Whether this will be a short-term top or something far more significant remains to be seen. The form taken by the coming correction will allow us to anticipate whether we have one more run at the top of the range before crashing, or whether we crash more directly. pretzel, you think "we" have topped out today? or in other terms if we;ve already reached minor 2? that be months before your previous analyses, or? just seems like there is still some more room to go up. Sorry for any confusion. 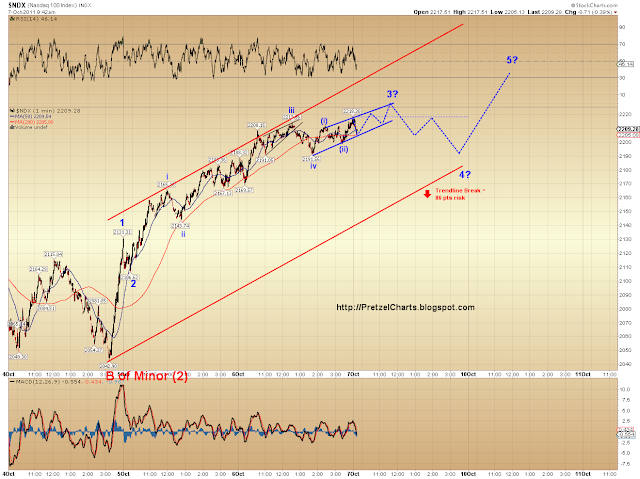 I think, in the SPX, we likely topped wave A of an A-B-C for Minor (2). The possibility for the NDX exists that we topped all of Minor (2) (red count), but it is more likely A of Minor (2) for the NDX as well. The problem with the NDX is if it exceeds its previous 2011 high, the Minor (1)/Minor (2) count is completely wrong... and it's very close to the prior highs already. you're welcome. i am a novice when it comes to the EWT but understand most of your explanations, which are pretty straight forward and good to follow. It sometimes are all the different ups in an up trend and downs in a down trend that can be confusing and hard to keep track of as to know exactly where "We" are in the wave and for what index, which is critical in EWT. Anyway, keep up the good work your response certainly improved and deepened my understanding of where the markets are. it will be interesting to see how this will all play out.